Bajaj Pulsar 220 DTSi FI is a new macho bike launched by Bajaj. This bike has created a sensation in the Indian bike market. It is supposedly the fastest bike in the country. Although, its production has been limited, yet the bike has caught the attention of the bike enthusiasts all over the country and the bike surely holds a great future in the country. Bajaj Pulsar 220 DTSi FI is available in four different colours – Red, Grey, Blue and Black. The ellipsoidal projector headlamps, raised 3D graphics on the fuel tank, clip-on handle bars, sleek tail lights are eye catching. The bike has all black engine. The black alloy wheels give a sporty look to the bike. Bajaj Pulsar 220 DTSi FI has various comfort features. The self start bike has Digital Fuel Gauge, Analogue Tacho Meter, Digital-1 Trip Meter, Digital Speedometer and Passenger Footrest. Other comfort features include Passenger Backrest, Pass-light and Low Fuel Indicator. Split Seats provide the much needed comfort for rider and pillion. Bajaj Pulsar 220 DTSi FI has focused on safety aspects. 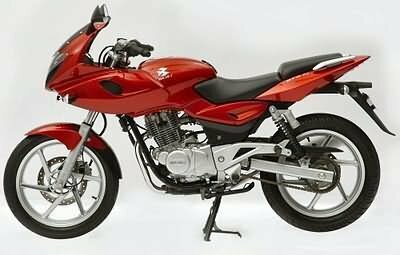 The bike has telescopic hydraulic type front suspension and rear suspension comprises of Elliptical section swing arm with twin hydraulic gas charged shock absorbers. The bike consists of disc brakes (both front and rear). The soft compound tyres increase grip on the road without sacrificing the stiffness of the tyre. Bajaj Pulsar 220 DTSi FI consists of 220 cc, Air cooled engine. It produces a maximum power of 21.04 PS at 8500 rpm and a maximum torque of 19.12 Nm at 6000 rpm. The engine sports 5 speed gearbox. The price of Bajaj Pulsar 220 DTSi FI is Rs.70,000 (taking Delhi as base price location). However, the price specified is indicative price only and reflects lowest approximate price which excludes tax, registration, insurance and cost of accessories. 150 looks is lotally different from 180.